Which is better? Coming up with a new idea, or getting lots of people to like that new idea? Just as in most places, in film we see lots of new ideas all the time, but greater acceptance of these new ideas is relatively rare. As a form of art, film is a media full of new and interesting things. However, it is also a business, and in general it is difficult to sell things which people have not already experienced and had a positive response to. For this reason, innovation in mainstream cinema can seem to move forward at a snail’s pace. Big studios want to make what sells, and taking creative risks is not friendly to the bottom line. The Matrix is a big budget film which broke through this struggle. It is a film we recognize for bringing new ideas to the big screen. However, even though we recognize The Matrix as an innovator, many of its ideas were actually not new. The Matrix’s creators, The Wachowski’s, have not been shy about describing their inspirations over the years and how they cobbled them together into this hit film. Below we look at some of the biggest sources of their inspiration and how those ideas made it into the final film. The Wachowskis loved Hong Kong action films. Historically, these type of films brought martial arts to modern storylines, but Hard Boiled was a little different. This was a crime story, but with guns. Lots and lots of guns. Hard Boiled was released in 1992 and was very much ahead of its time because of the way it filmed its action. This was an action movie where the action sequences revolved around gunplay. It took the same choreographed approach to martial arts fights, and applied them to slick gun battles. And more than just highlighting the potential entertainment factor of gun fights, the film used long tracking shots, slow motion, first person perspectives, and lots of violence and flying debris to make the scenes as gritty and as engaging to the viewer as possible. Oddly enough, there were two unrelated things called “Hard Boiled” which influenced the Wachowskis. The second Hard Boiled was a Frank Miller science fiction graphic novel set in a future dystopian Los Angeles. While there is some parallels between the dystopian setting, and the fact that the protagonist isn’t actually who he things he is, the biggest influence of Hard Boiled on The Matrix was the visuals. The Wachowskis loved artist Geof Darrow’s haunting interpretation of the future so much they actually hired him to design the “real world” setting in The Matrix. His attention to detail led to the buzzing, insect-like machines. Darrow even helped the Wachowskis storyboard the entire movie before it even went into production. When Keanu Reeves was cast as Neo, the Wachowskis gave him some reading material to prepare for the role. One of the books he was given was this essay on postmodern philosophy by Jean Baudrillard. In this book, Baudrillard comments on how society has strayed from what is actually real. Our modern world is essentially created to cater to us, so much so that we often prefer the fake things in our lives over the real ones. It is a play on the ideas of Plato, who introduced the concept of the simulacra. Plato argued that the reality we perceive is not real at all because of various logical contradictions which exist. And so when we discuss our reality, or reflect upon it with our art or philosophy, we are essentially copying a copy. Baudrillard takes this idea a step further to explain how modern life is so reliant on these false truths that the “truth” of the world around us doesn’t even exist any more. 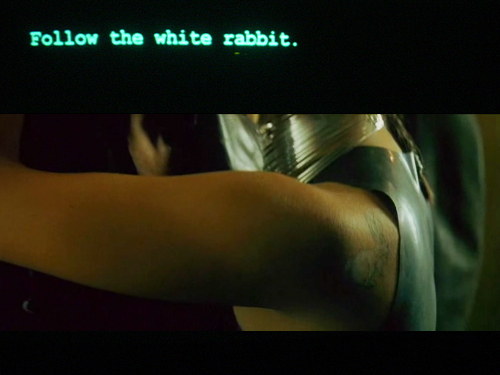 The Matrix and Lewis Carroll’s famous novel are related by more than just a few lines of dialogue in the film. For one, the plotlines are very similar. Both feature a protagonist who is cast out of their own world into one that is unfamiliar. Both of these protagonists find this new world after following a white rabbit, and both of their journeys into this new world are essentially foretold by a prophecy. On a higher level, both the novel and the film deal with the relationship between self and reality. Both works reference dreams, specifically the possibility of living inside of one. Fist of Legend was another Hong Kong action film which heavily influenced the Wachowski’s. This film, starring Jet Li, is more traditional compared to Hard Boiled, with expertly choreographed martial arts fight scenes. The Matrix matches much of the brutality of the fighting in this film, but it also echoes its style. Fist of Legend was choreographed by Yuen Woo-Ping, who the Wachowskis were eventually able to convince to work on their film. He trained all of the main actors and choreographed the fight scenes between Morpheus and Neo. Watching the final fight scene in Fist of Legend, you can clearly see the similarities in technique, showmanship, and focus. The Matrix is a seminal Cyberpunk film, so it’s no surprise that there are similarities with William Gibson’s seminal Cyberpunk novel. For starters, both Neo and the protagonist of Neuromancer, Case, are computer hackers. In Neuromancer, people are able to connect to a central computer network, which is fittingly called “The Matrix”. Case is assisted by a strong female samurai warrior called Molly Millions, whose artificial implants give her an edge in combat over most of her foes. Much like Trinity, she is the one who essentially “saves” Case from his previous dead-end existence. Another cyperpunk classic which bears an even stronger resemblence to The Matrix is Ghost in the Shell, first published as manga in 1989 and then as an animated film in 1995. Ghost in the Shell was a huge influence on international audiences because it brought the anime style into the mainstream for the first time. The Wachowskis borrowed a lot of the visual ideas from Ghost in the Shell to incorporate into their film. Most obvious is the shifting green text which makes up The Matrix. Ghost in the Shell also has action sequences where characters can seemingly bypass gravity and can essentially slow down time, both techniques used by the Wachowskis to stylize their action. They also pause with their characters in certain poses, just as if they would be framed in a comic. Thematically, Ghost in the Shell features a main character who is learning the truth about herself as the plot unfolds. She is a cyborg and can “plug herself” into the networks with ports on her body just like the human’s in the real world are able to plug themselves into “the Matrix”. Out of Control was another piece of required reading for Keanu Reeves by the Wachowskis in his preparation to play Neo. Out of Control was written by Kevin Kelley, who was the founding editor for Wired Magazine. In the book, Kelley discusses how rapid technological development of machines could result in a seamless substitution of the natural order with the unnatural. It is a look at how society could become influenced by machines, and how advancements in engineering will eventually be indistinguishable from advancements in biology. The film explains how we are at the cusp of this transformation, just like how in The Matrix the machines model “the Matrix” after human society at the turn of the 21st century because it is considered the height of our species. The Invisibles is another comic series which heavily influenced The Matrix. 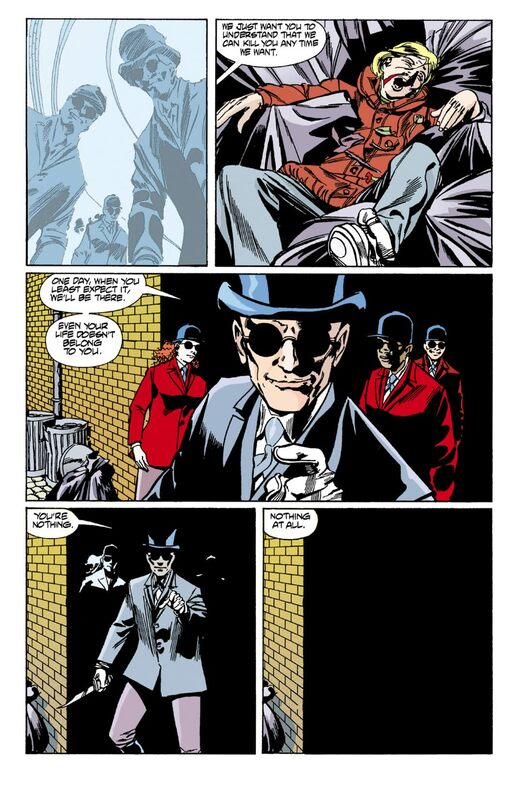 The Invisibles was first released in 1994 and took place over different time periods and places. The common thread was a fight against a grand conspiracy to keep the human race subdued. People are fed subliminal messages to keep them in line and those that act out are tracked down by an organization called The Outer Church, which worships powerful interdimensional beings which will come to Earth to take over once humanity has been fully oppressed. Fighting against this conspiracy is a group of misfits known as The Invisibles. Many of them are outcasts who band together to work towards the common goal of saving mankind from a horrible truth most people don’t even know about.